A capo is a clamp that fastens around the neck and holds down all the strings at the chosen fret, raising the pitch of the ukulele and increasing the potential for playing in different ukulele keys. The capo is a very useful tool for the ukulele player. By clipping it onto the neck at various position, you can play the same chord shapes you already know, but you will be playing in new ukulele keys, and they’ll sound like new chords! If you can play C, F, G and Am (4 extremely common chords in the key of C), then you can put a capo on and play those same shapes and play in the keys of Db, D, Eb, E and F. You could go higher than the 5th fret but the ukulele is a small instrument and it will get cramped! But isn’t this cheating? No! 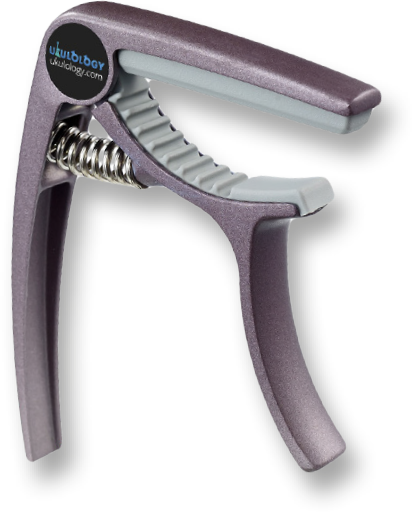 Guitarists have used capos for years, as a quick way of changing the key of a song. Yes, of course eventually you will want to learn to play in those ukulele keys without a capo, but even then a capo can be very useful. 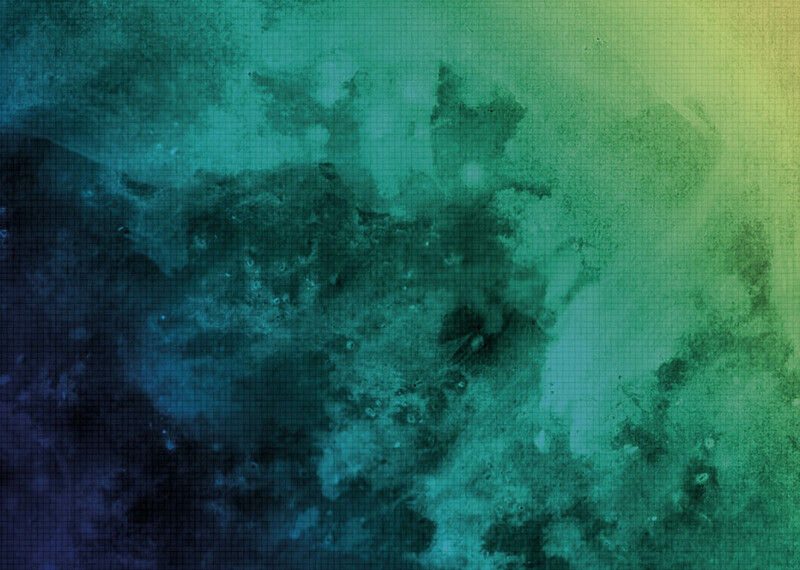 Sometimes you just need to quickly raise the pitch of a whole song to suit a singer you are accompanying. A capo is useful when you want to keep the ringing sound of open strings in a new key. Some songs can only be played in one key (e.g. fingerstyle pieces that combine open strings with fingerings further up the neck), and the only option for a key change is to use a capo. If you play baritone ukulele as well, you’ll find you can put a capo on the 5th fret and play it as if it’s a soprano-tuned ukulele! Always keep a capo in your ukulele case, you never know when you’ll need one! Do you have a song you can play, but struggle to sing? Try putting the capo on a few frets up and see if it gets easier to sing. As well as changing key, a capo is a great tool to use when arranging. Have one player use a capo and another play without one. Try and find shapes for the capo user to play that go with the chords the non-capo user is playing. See how the C and G chord shapes played with the capo at the 5th fret make an F and C? That should help you get started! 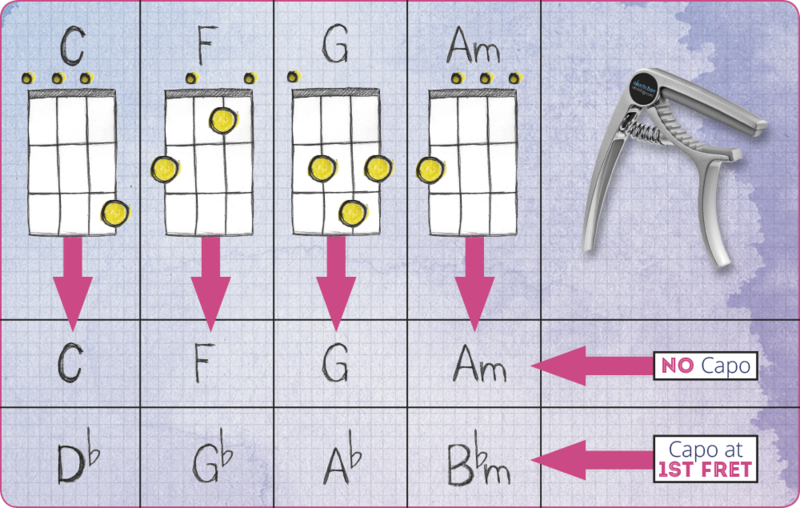 Download our FREE Capo Chord Chart PDF and keep handy when you’re playing. Simply fill in the form in the green box. 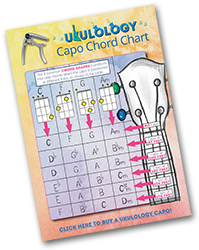 Simply fill in the form to receive the Capo Chord Chart PDF as well as standard chord charts, strumming patterns, songs, backing tracks and more! 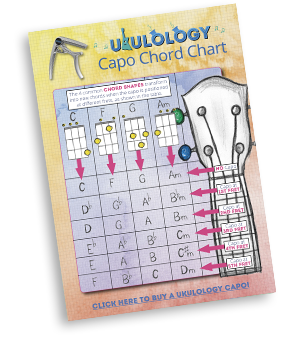 Download our FREE Capo Chord Chart!